I find Red Rock to be just like most other brew pubs: sufficiently adequate. The food at Red Rock is generally pretty tasty, but it always seems to lack any sort of finesse that would set it apart from competitors. The goat cheese bruschetta was delicious. The bread had a nice texture, and the goat cheese spread was really, really good. I had the chicken schnitzel, which was served topped with gruyere and a delicious demi-glace, but the chicken itself was a bit rubbery. The side of peas was quite tasty, and the horseradish mashed potatoes was the star of the plate. Denver, our server, was efficient and accurate. She always kept our glasses full and checked up on us frequently to make sure everything was ok. 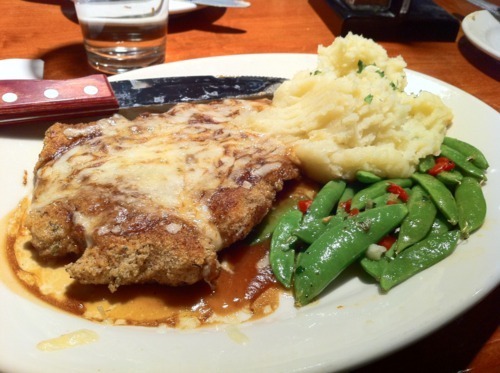 Overall, Red Rock is a good place to go for a reliable, tasty meal. Just don’t expect to be overly wowed by the food.